When you’re at a trade show, your #1 priority is to attract people to your booth. A promotional prize wheel is a great way to attract people to your booth, but if you’re going to be sharing the floor with other booths that also have prize wheels you’re going to have to think of a way to make yours stand out. If you want to make sure that your prize wheel is a fan favorite at your next show, follow these simple tips. If you want to have people lining up to spin your prize wheel at your booth, you’re going to need to have a game that people will want to play. There are a variety of ways you can spice up your prize wheel to make it look more eye-catching. With fun section counts, special sections and an infinite number of color combos, make your wheel unique! Draw even more attention to your booth with dazzling LED lights! Some people may have lights, but they only turn on when the wheel is spun. Others have lights that stay continuously lit. Our LED lights come in a rainbow of colors and can even light up with different patterns. Available in both battery powered and AC adaptable, there’s nothing to bring more attention to your booth than a light show on your promotional prize wheel. The beauty of Spinning Designs prize wheels is that our customers can customize them practically any way they prefer. You can make wheels that have your company logo on them, company colors, company mascot, and anything you desire. Branded wheels don’t just look fantastic, they also help the wheels look more professional and official. As long as the text and pictures can fit, we’ll add it to your wheel. This entry was posted in Uncategorized on June 25, 2013 by spinningDesigns. Who doesn’t love a spinning a prize wheel? Carnival games with wheels are always a big draw and kids seem to go absolutely crazy at any arcade equipped with prize wheels. Despite the general popularity of the prize wheel, some people may think that prize wheel games have been done to death. 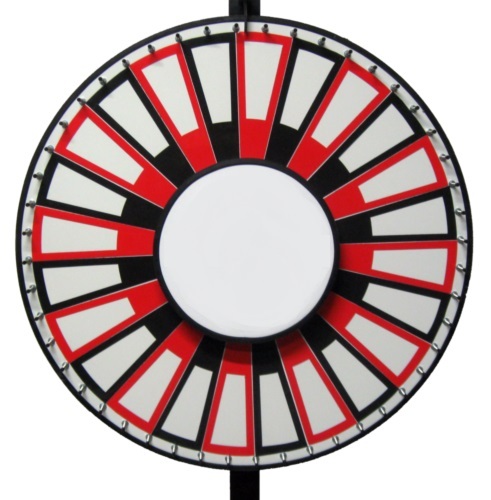 If you want to add some excitement to your prize wheel shenanigans, the simple addition of a dry erase prize wheel could help you substantially. A dry erase prize wheel is flexible, fun and a major appeal to anyone trying to draw attention to their cause. Teachers looking to spice up their classrooms could make a wheel their new, innovative student call-on tool. Instead of waiting for hands to slowly rise to volunteer to do the next math problem, simply write your student’s names on your wheel and give it a spin. After adding the wheel, don’t be surprised if you see an increase in overall student class participation. Kids will appreciate the small change to their routine and could find the wheel a fun new classroom addition. Consumers love sales and deals, but people are sick of e-mail offers and GroupOn deals. Get a dry erase prize wheel for your store and keep it near your check out area. Fill the empty wedges with 20% off, buy 1 get 1 free, store credit, and other customer deals, then ask your customers to give the wheel a spin after their items are rung up. If you feel like having a little fun with your customers, add some different unique customer feedback options to your check out wheel. Instead of winning discounts you can request their opinions on your merchandise or your customer service. Are you the parent who plans their child’s birthday party to the minute? The invites are out, the favors are bought and you’re ready a month before your little one’s big day. Whether to fill a gap before presents or to try something new, a dry erase prize wheel is the icing on the cake. Make up a new game, win party prizes or be adventurous and spin to see what will be the next party game. A dry erase prize wheel is versatile and flexible enough to use year after year regardless of your child’s age. One quick tug on the wheel of a Spin the Wheel game, and the suspense – and fun – begins. Spaces marking big prizes, and a few not-so-big prizes, all roll by. Clicks gradually become further apart as the wheel slows. Players cannot help but smile with anticipation as they wonder where the clicker will land when the wheel finally comes to a stop. Many families experience this excitement at their local summer carnival or on the boardwalk of a nearby beach town, but the fun doesn’t have to stop there. Why not get your very own version for home? A spinning wheel can be used around the house to determine the genre for a weekly movie night, what board game to play on a rainy afternoon, or who chooses the restaurant for Sunday lunch. With our Spin the Wheel games, families can have their very own wheel that will do just that. Just like the “Spin the Wheel” games that families love to play on the boardwalk, custom prize wheels can be ordered for home use. Any type of prize or task can easily be written, placed, or printed into the wheel’s open panels. Families who want a wheel with a single purpose, such as choosing a child’s reward for chores done well, can select a pre-printed model. When ordering, customers select each element – text, color, style, images, and theme – to suit their needs and taste. Therefore, football enthusiasts can have the colors of their favorite college team, science fiction fans can have an image of outer space as a backdrop, and parents can make a chore-free day one of the prizes. You can even place a family photo in the center logo area if that’s what you want! Some customers may want more versatility than our printed models offer. For them, we have models that feature dry erase boards and magnetic frames for using different inserts, making changing text and switching illustrations easy. Customers print the graphics they want from their home computer. The frames are even strong enough to hold gift cards or Blu-Rays! With that versatility available, the same Spin the Wheel game that sports a superhero or princess theme for a child’s birthday party one day can be adapted for a neighborhood backyard barbecue or baby shower later. With so many possible uses, our customers can incorporate their wheel into just about any lifestyle. No matter how they use it, they’ll create fun and fond memories with every spin. This entry was posted in Uncategorized and tagged games, insert wheel, spin the wheel on June 20, 2013 by spinningDesigns.